I went shopping for furniture and tablecloths happened instead. I wasn’t looking for tablecloths, honest! Janeray and I sold so much furniture at September’s Vintage Bazaar that I went to the flea market at a bracing 6 a.m. to see what I could scare up to replenish our meager remaining stock. You gotta go early to get the good stuff. I’ve seen customers there before daylight, shining their flashlights into dealers’ vans as the poor guys are trying to unload in the darkness! Alas, I wasn’t quite early enough for a piece I would have snapped up in heartbeat—a vintage wood desk with a single drawer, a big old glass knob, and a black painted finish that just needed a little polishing. The lady standing right in front of me snagged it for under ten bucks. Darn! So I lost on furniture this time, but boy did I ever win it big on tablecloths! 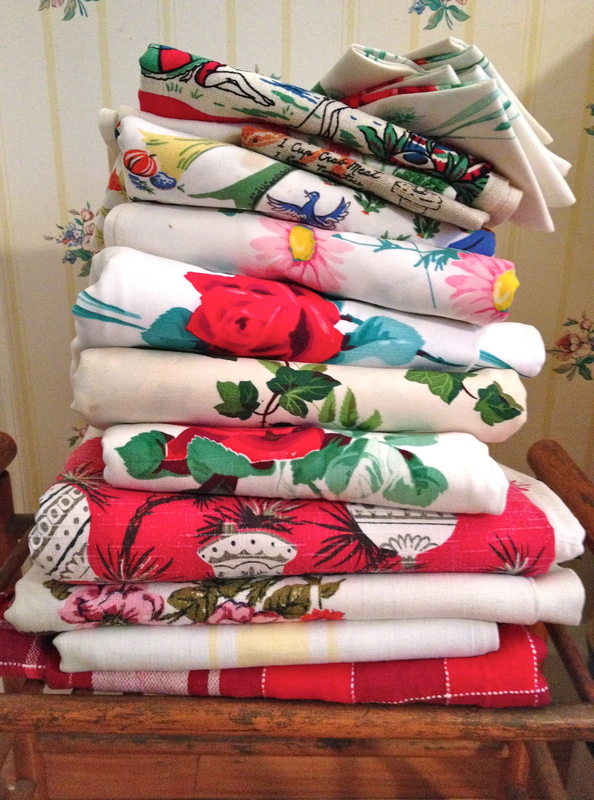 A whole bunch of dealers had piles of vintage linens that they seemed willing to practically give away. The reason probably is that almost all of them have stains small or large. If a dealer doesn’t specialize in linens, she usually doesn’t want to be bothered trying to get stained ones back to pristine shape. I don’t exactly specialize in linens, but I do love them, and I consider stains a professional laundry challenge, so . . . .
Here’s what I came home with! 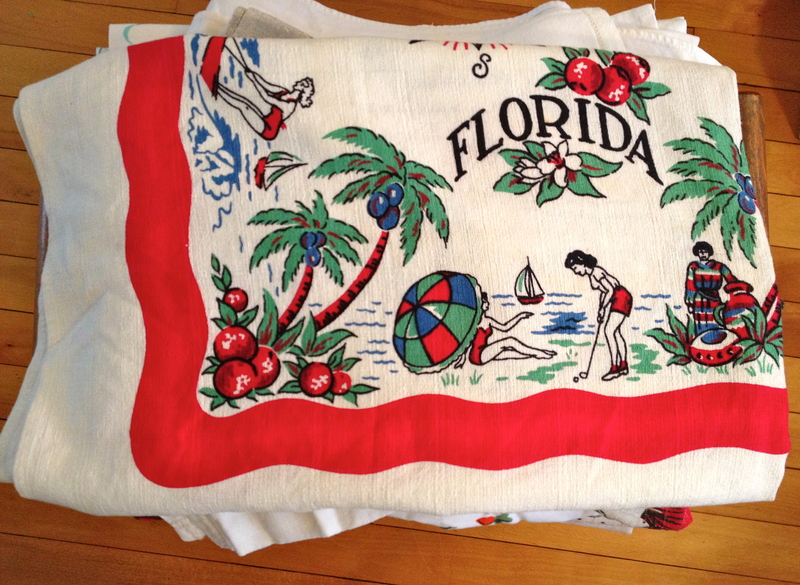 A card-table size Florida souvenir cloth. I love those blue . . . coconuts? giant dates? in the trees. Don’t you just love seeing what other people have done in their houses? I do! 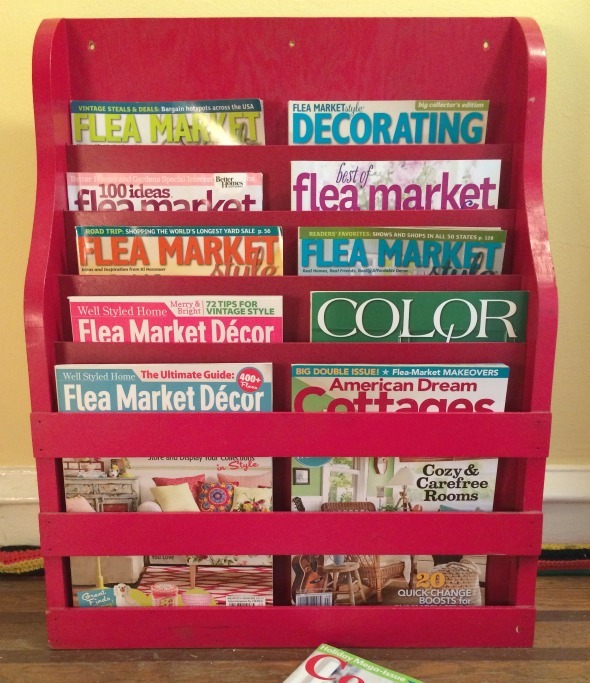 Flea market decorating has gone mainstream, judging by the amount of magazines you can find on the topic. I’m gratified to know my house is finally cool instead of just cheap! All these titles feature dozens of tips about what’s hot, how to convert trash into treasure, and where to shop. What they don’t do is tell you how to start decorating from scratch. Click here for my opinionated advice! Yes, I have to take back what I said about the Golden Nugget Flea Market being on its last legs. On Memorial Day weekend it looked like a throwback to twenty years ago. Every single dealer table was taken. Parking was impossible. The place was buzzing with excitement. I thought I was in a time warp. The flea market was incredible on Sunday. Some amazing things were for sale. Flea or thrift? Flea or thrift? Don’t make me choose! 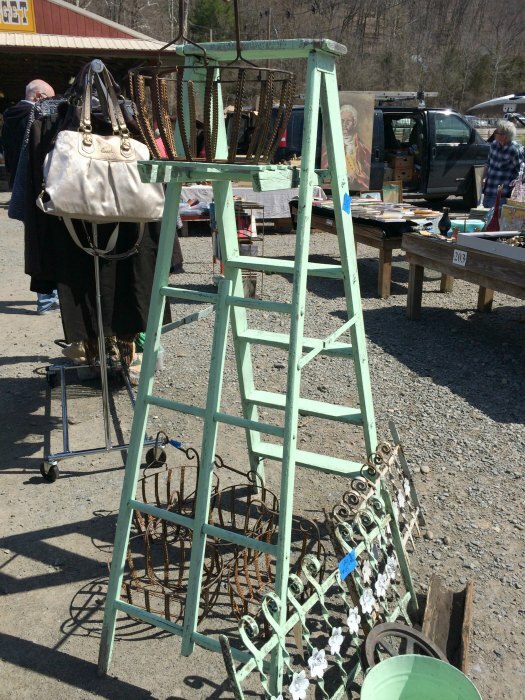 Loved the color on this ladder (which I didn’t buy). I think I’ll steal the idea, though. 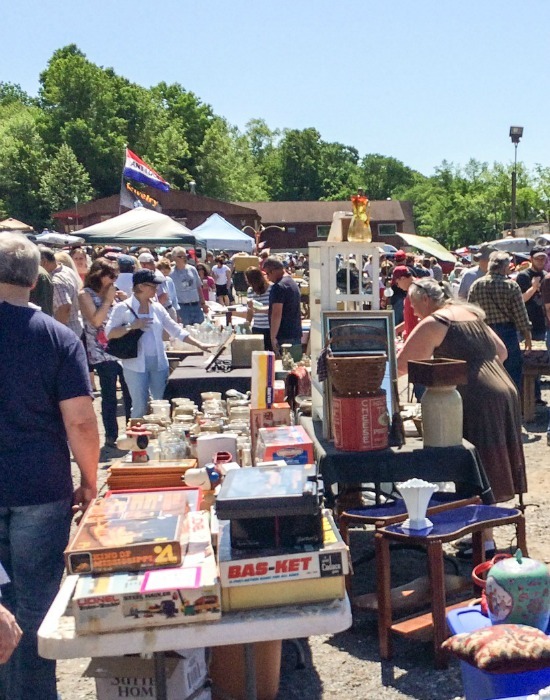 Yesterday ManRay and I did a marathon of shopping starting at the Golden Nugget Flea Market in Lambertville NJ. I haven’t been there since last summer and was surprised by how much the market has changed. At one time it was considered the preeminent antiques market on the East Coast. Month of Makeovers Day 10: it’s our Thursday Hack Flashback! We’re ten days into our Month of Makeovers! Janeray and I have decided we’re going to make our Thursday posts be quick little looks-back to where we got our vintage hacking genes. Let’s call it a Hack Flashback! 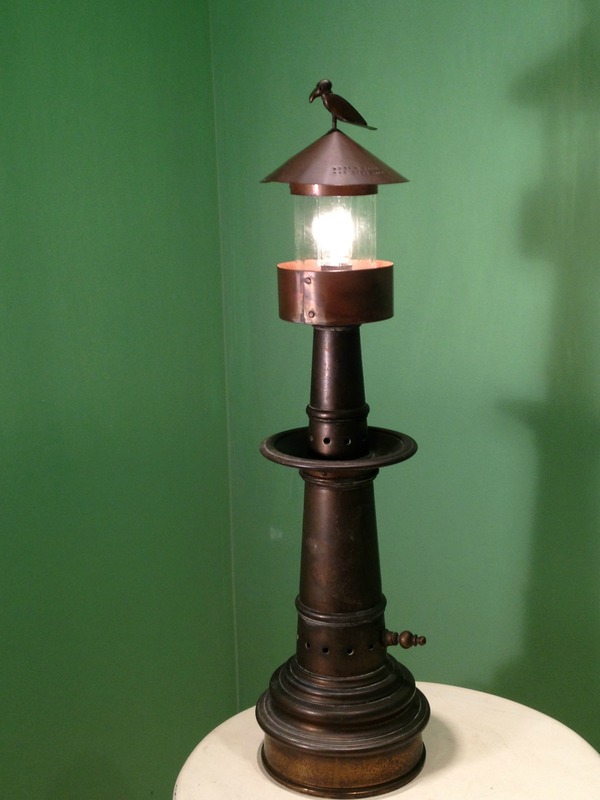 Today’s Hack Flashback is this amazing lamp my dad made. He loved making lamps and was always on the lookout for bases, lamp parts, and anything really—chunks of marble, brass doodads, glass bits, you name it.